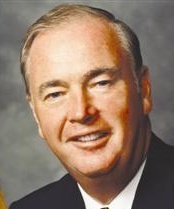 Frank Murkowski is a Polish-American politician who is the current Governor of Alaska and a member of the Republican Party. Previously, he was a U.S. Senator from Alaska from 1981 until 2002. Raised in Ketchikan, Alaska, Frank Murkowski initially attended Santa Clara University but graduated from Seattle University, both Catholic Jesuit universities. Prior to his election to the Senate in 1980, he worked in the banking industry in both Anchorage, Alaska and Wrangell, Alaska. During his time in the Senate, he was most notable as Chairman of the Energy and Natural Resources Committee from 1995 until 2001. As chair, he argued and attempted unsuccessfully to open the Arctic National Wildlife Refuge to oil drilling. He was elected governor on November 5, 2002, defeating his Democratic opponent, Fran Ulmer 56%-41%. He succeeded retiring Democrat Tony Knowles and took office on December 2, 2002. Upon being inaugurated as Governor, he resigned his Senate seat and appointed his daughter, Lisa Murkowski, the Majority Leader-designate of the Alaska House of Representatives, in his place. This led his opponents to accuse him of nepotism. He has six children with this wife, Nancy. He currently resides in the state's capital, Juneau. As of November, 2005, according to a poll, Murkowski has the second lowest approval rating out of the 50 governors. His approval rating is only 26%, while his disapproval rating is 68%. Much of the disapproval is over a recently purchased jet using state funds. Murkowski's use of the jet over cheaper commercial air travel has caused controversy among citizens as well as legislators. Senator Kim Elton publishes a newsletter detailing each time the jet is used, the cost, and the price of a first class commercial ticket the same day to the same destination.